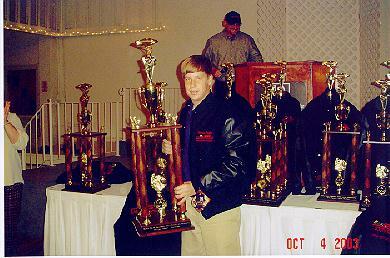 After a big scare in the season finally Thomas picks up the Champions trophy and Jacket at The Sunny South Raceway Banquet. Mobile 8-22-03-A regular Friday night of racing turned real interesting as 3 of the top Bandoleros in the country traveled south from Georgia to race in Mobile. With their home tracks being closed for the weekend, Jonathan Chandler, currently ranked #1 in the country, and the # 9 and #11 drivers made the trip to Mobile for a little Friday night racing action. With the Moose's national ranking, 4 of the top 15 in points in the nation were set to get it on at Sunny South Raceway. Add the other Sunny South regulars and the table was set for some awesome racing. In the first heat race the Moose got a terrible start and it relegated him to a 3rd place finish. The second heat race would be different, the Outdoor Channel Bandolero got a great start, the Moose led every lap until the last corner of the last lap, Chandler got into the back of him coming off turn 4 and they both spun. It was now clear to the teams from Georgia they had their hands full. The heat races gave the Moose a bad starting spot for the feature but he was loaded for bear. From the drop of the green flag he was a man on a mission. Lap by lap he put cars behind him, first the Mobile regulars then the #11 and #9 cars in the country as he worked his way into the second spot. At the end, the distance would be too much to make up and he finished 2nd. 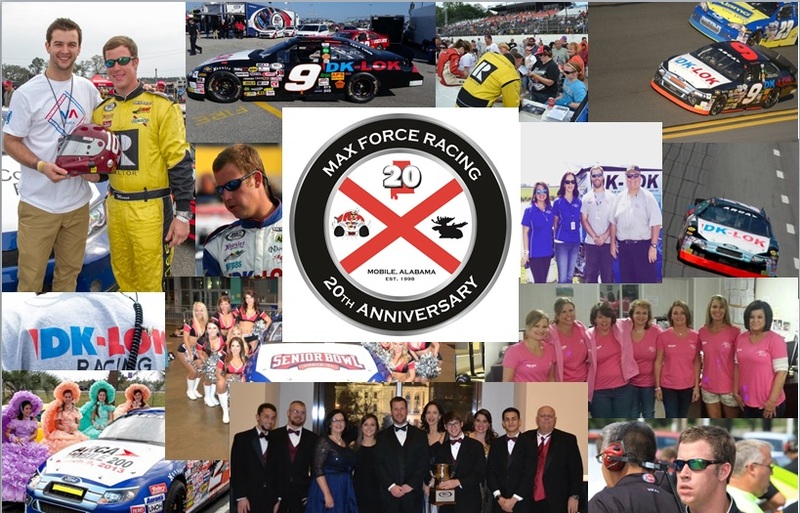 The Moose and the Outdoor Channel Bandolero served notice Friday night to the national points leaders, if you come to Mobile you better bring your A game. 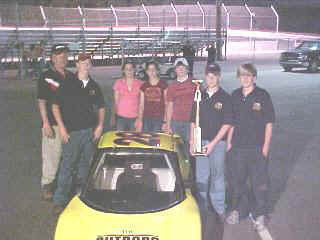 Mobile 8-15-03-The Moose rolled into the 600 Racing regional race Friday night looking to improve on his national points standings. 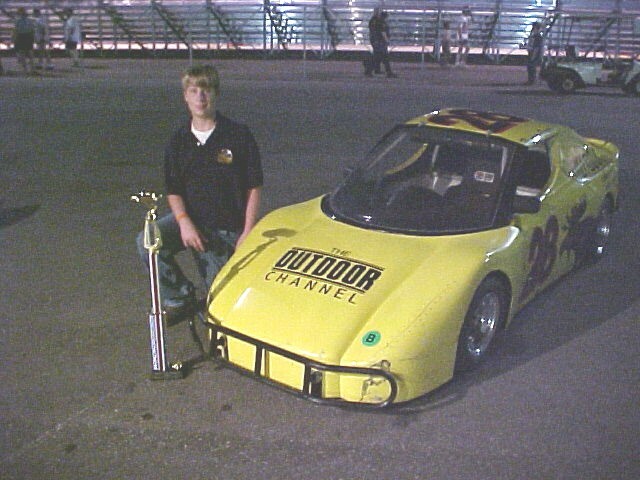 Because points are only awarded for the feature event, Thomas used hot laps and the heat races to dial in The Outdoor Channel Bandolero. The Moose was on the loose turning laps faster than he's been all summer. However, being a regional race the Moose wasn't the only fast car in the field, Justin Shoemaker's lap times were just as fast and it looked like we were headed for a barn burner in the feature. The Moose rolled on the track for the feature and he had problems before he made it to the racing surface. The brake calipers were fully extended and the brakes were locked up. Knowing how important the race was Thomas made the call to stay on track. At the drop of the green flag the Moose fell back with his car was almost a full second slower than his practice times. 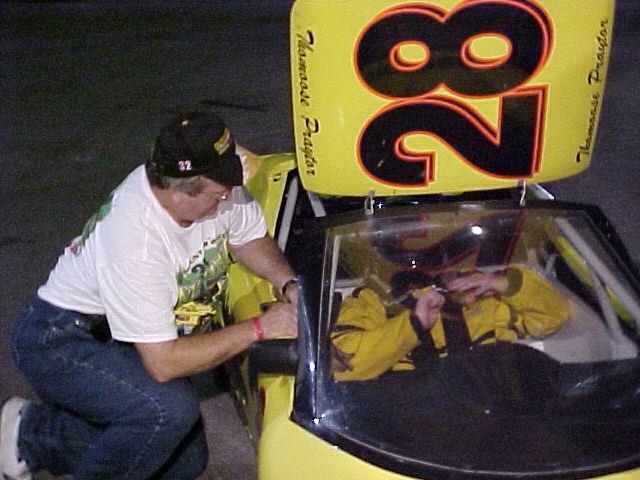 As he made laps, smoke started to trail from The Outdoor Channel Bandolero as the brake pads were burned off. Towards the end of the race the pads burned off enough that he was able to make his way back up to a 3rd place finish. 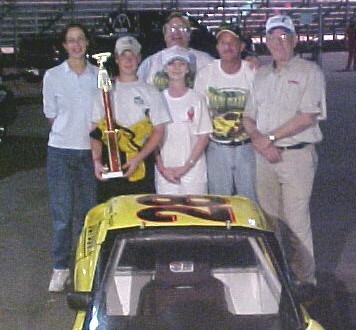 Mobile 8-8-03-While the crew cheif was out of town the Moose picked up his 14th feature win at Sunny South Raceway. The night's action all but assured The Outdoor Channel Banodlero it's first track championship. 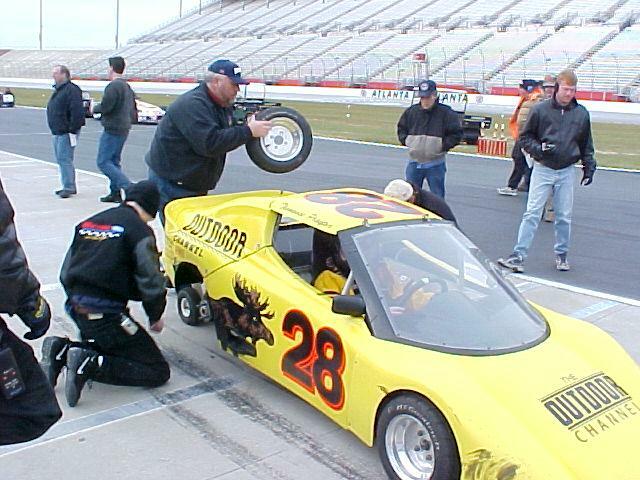 Mobile 8-1-03-The Moose was abused in his last outing at Sunny South Raceway and he was looking to get back to winning form. 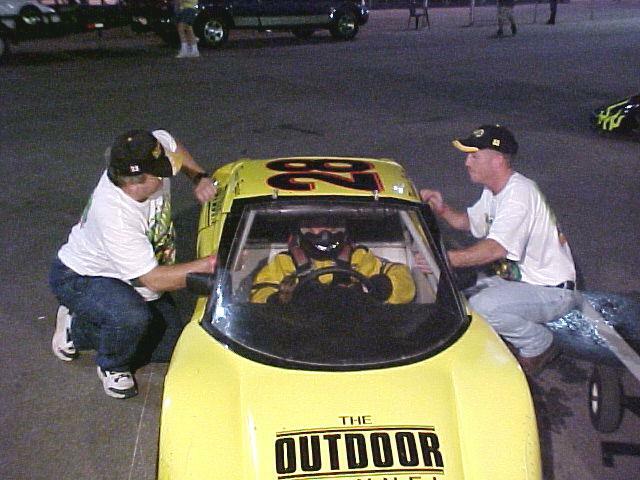 Off the trailer The Outdoor Channel Bandolero was quick and the crew made changes to make him even quicker. In the first heat race the Moose took the lead at the drop of the green flag and lead every lap, stretching his lead to almost 1/2 a track in just 10 laps. With an invert start for the second heat race Thomas had to work a little to get to the front. The leader ran him into the grass in turn 3 and the Moose dropped back to get a run. Off of turn 2 the Moose was on a run and had almost cleared the leader. 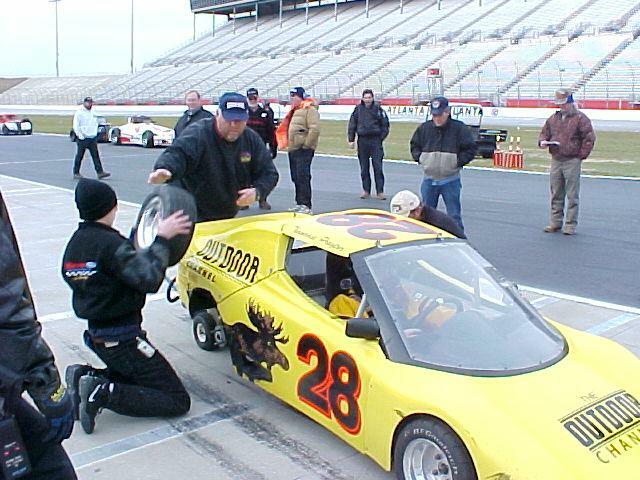 As the Outdoor Channel Bandolero was ahead of the leader on the back straight, the leader made a left turn into the Moose hitting him in the passenger door just in front of the rear axle. The leader hit him so hard it bent the rear axle so bad it knocked the chain off and the race was over. 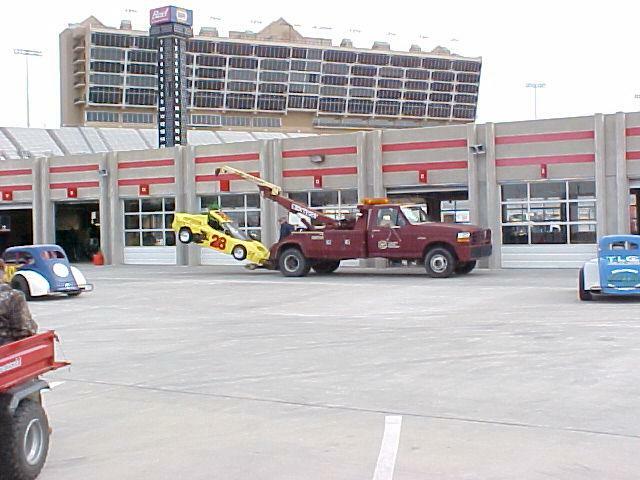 As the wrecker brought the TOC Bandolero back to the garage the crew got ready. It takes over 2 hours to replace an axle in the shop with all of our tools at our disposal. Since the Bandoleros are the last heat race and the second feature we would have about 20 minutes. 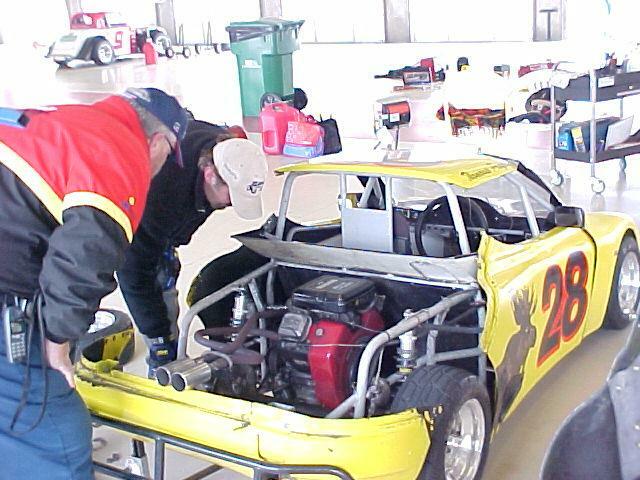 Everyone went to work, 4 people went to work on getting Mike Ludlow's car ready for Thomas to make a few laps if we didn't get it fixed. The rest of the crew went to work on the car, 1 person on each side of the car unattached the axle and then started pulling it apart. One group at one end of the bent axle, handed the parts to another group holding the new axle. Since we had just replaced the axle we were familiar with the measurements to slam it back together. While we had 2 groups working, one on the back up and one on replacing the axle we put another group to work servicing the car, gas fluids etc. The axle was back together and while we put it back in the car our driver got ready and strapped in. The team got the axle in with enough time to get the body back on and get in line with time to spare for the feature. The team was fired up on giving our driver a chance to compete for the win! From the drop of the green flag, it was obvious the crew was not the only one that was fired up. The Moose horned his way to the lead by the first turn and wouldn't let up. 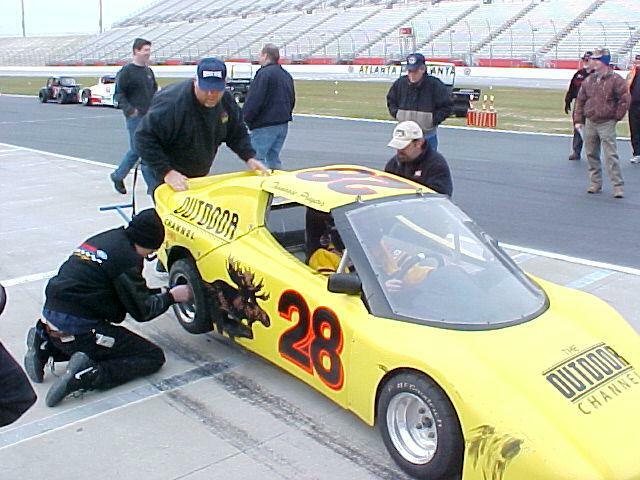 In a beat up, half way, prepared car that was jammed together in less than 20 minutes the Moose was leading and turning laps faster than the track record. He built a huge lead on the field and was ready to start lapping people when he eased up for the last couple of laps. When the Moose crossed the finish line the 2nd place car was 40-50 car lengths back and he had his 13th feature win of the year. 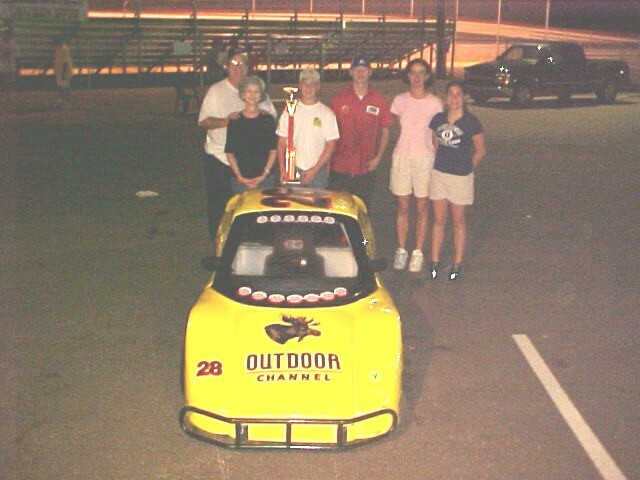 Mobile 7-25-03-The Outdoor Channel Bandolero headed into last Friday night looking to capitalize on a strong run and a return to victory lane the previous week. Off the trailer the Moose was quick and it looked like it was going to be a good night. 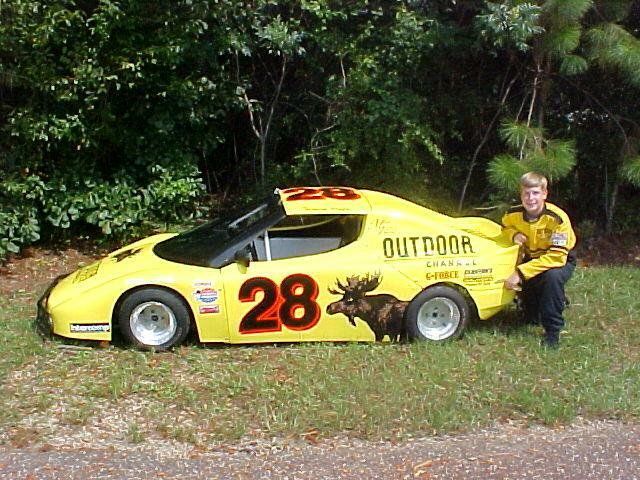 The first race ended early when the Moose ran over some oil dry and he backed the car into the wall. The guys patched the car up and got him ready to roll again. The second heat race would be worse, the car got loose off of turn 4, and got tagged from behind. The car hit the wall with the left front first and then whipped around and hit on the left rear. This time the car couldn't be fixed and it looked as if Thomas would miss his first feature of the year and lose valuable points in his hunt for the championship. Mike Ludlow came to the rescue and let Thomas borrow his car for the feature and he picked up some valuable points. Mobile 7-18-03-Fresh skin in place the Moose gets back on track with a win. 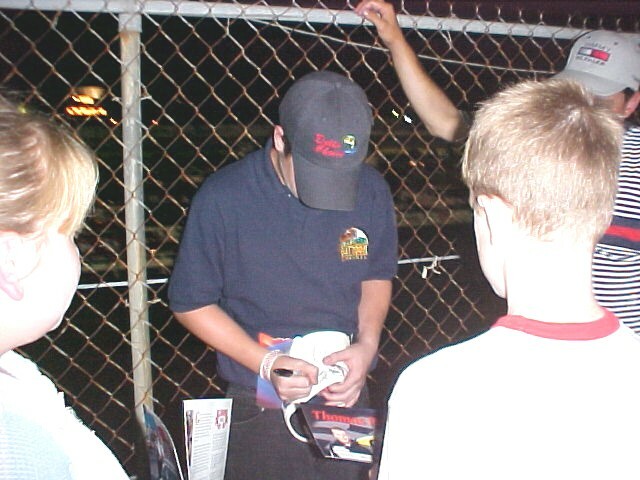 Mobile 7-11-03-When your on a winning streak you hate to change anything. Eight feature wins in a row and 22 out of 23 can have you doing some weird things to keep it going. One of those has been, the body of The Outdoor Channel Bandolero. The Moose has been running this skin since last year and the doors were original equipment. Mobile 7-4-03-Closed 4th of July. 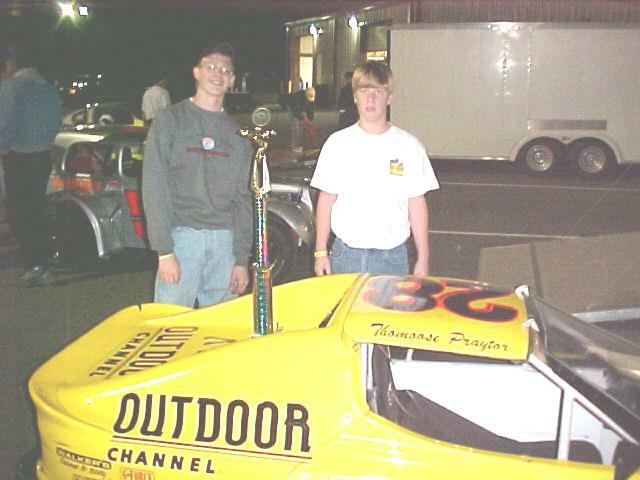 Mobile 6-20-03-The Outdoor Channel Bandolero rolled off the trailer Friday night looking to continue a hot streak that has propelled Thomoose to 7th in the nation. While Thomas has had the hot hand lately the competition is getting tighter every week. Friday night Brandon Wood lead from the first lap until Thomas was finally able to get by with 2 to go. 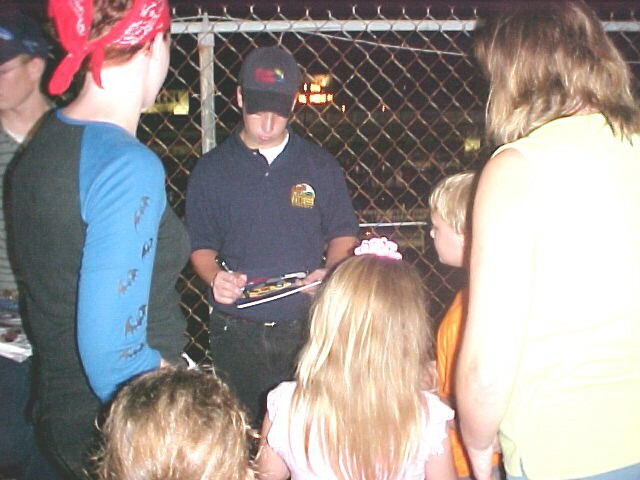 Mobile 6-13-03-For the first time in his racing career Thomoose went to the track without his Dad and I think everyone was fine with it but me. Of course it wasn't like he went to the track single handed, he recruited Tom Claxton with 40+ years of racing experience in just about every kind of car that can be driven as his crew chief. Then he hooked Susan & Buddy Peoples off our ALLTEL Pontiac to pitch in, they added their son Brandon, throw in his Mom and Sister and I don't think there was room for me anyway. 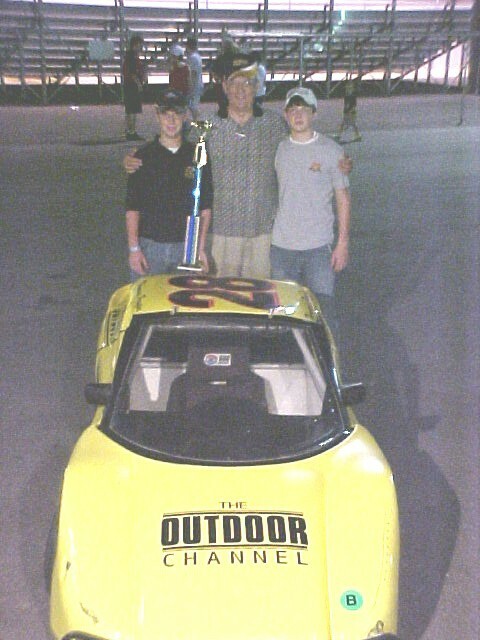 The guys tell me the night belonged to The Outdoor Channel Bandolero from the moment Thomas made his first practice lap. 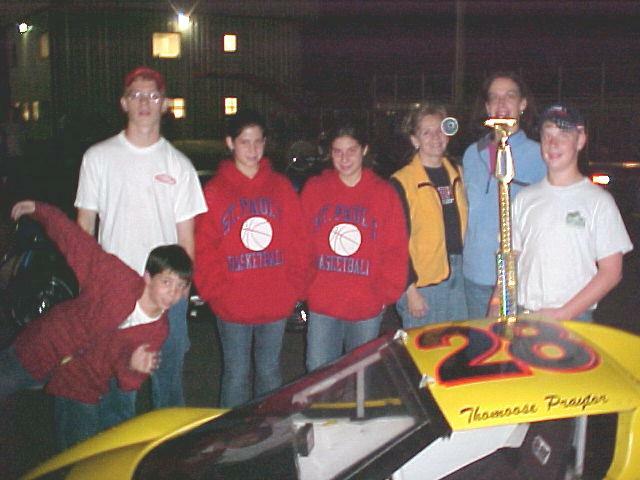 Thomas was focused on making it seven in a row and in each race he would not be denied. When the final checkered flag flew, The Outdoor Channel Bandolero had won both heat races and the feature! The Moose's performance was awarded with a trip to the technical inspection building. After a once over by the track's tech officials Thomas was cleared and handed his seventh feature win in a row and making 20 out of 21. 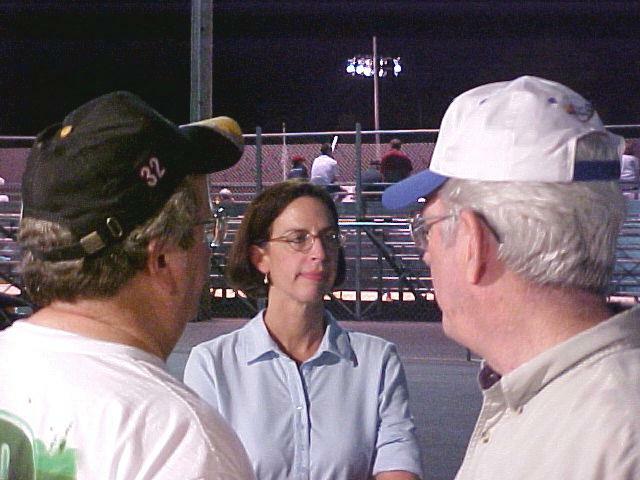 The brain trust for the night confer with Thomooses Mom. Buddy Peoples helps the Moose strap in. Thomas on the phone with an absent crew chief. Buddy & his son Brandon put the finshing touches on another big win. Mobile 5-30-03-The Outdoor Channel Bandolero rolled onto the track Friday night looking to add to a blistering hot streak. In the last 5 weeks, Thomoose has been near perfect stringing together 5 straight feature wins. Off the trailer Thomas was good and worked hard to get better. The heat races saw a lot of great racing but when the green flag dropped on the feature the Moose was on the loose! The Outdoor Channel Bandolero kicked to the lead going into the first turn and lead every lap on the way to his 6th feature win a row and 9th of the year. Mobile 5-23-03-Moose Wins the Drive for Five!-Inspired by the front row qualifying run by Tony Raines in the Outdoor Channel Busch car Thomoose was pumped up to try and make it 5 feature wins in a row. 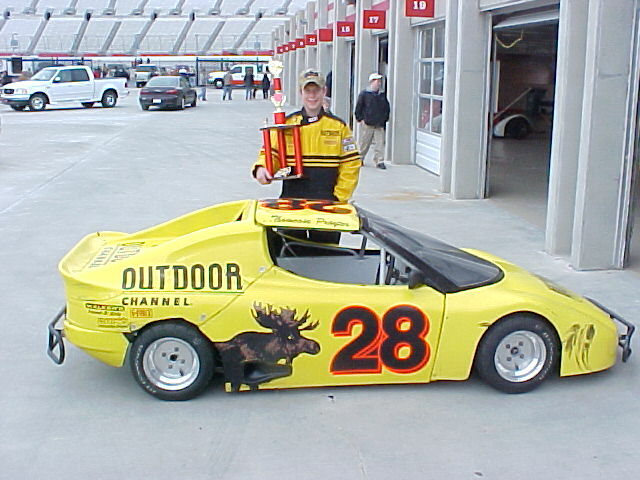 Off the trailer The Outdoor Channel Bandolero was strong and turning lap times way under the track record and the Moose was on the loose. The drive for five had Thomas taking the lead on the first lap and he lead every lap until the checkered flag flew. Thomas has now tallied 5 feature race wins in a row and has 8 feature wins in 10 starts. Mobile 5-16-03-The Moose Dodges A Bullet-Thomoose was hunting for another feature win on Friday night and dodged a bullet. With last weeks exciting finish the team went back to work on The Outdoor Channel Bandolero looking to make it a little quicker. Our driver worked hard in practice and he was quicker than ever before. The first heat race went all Thomas's way and he extended his winning streak (Heats and Features) to 10. The second heat was going his way when the throttle cable broke and he coasted back to the garage. There wasn't enough time to replace the cable, so the crew jury rigged a patch and sent him back out for the feature. The Moose thundered to the lead, then everyone held their breath to see if the patch would make the distance. The patch held and Thomas had his 4th feature win in a row and now has accumulated 7 feature wins in 9 starts. 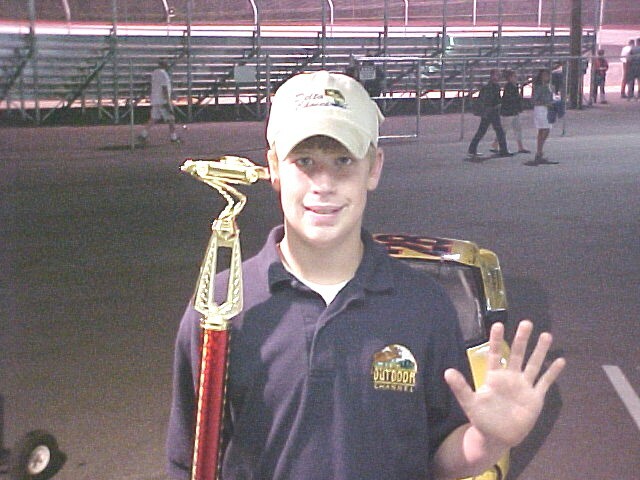 Mobile 5-9-03-Thomoose was looking to park The Outdoor Channel Bandolero in victory lane for his third consecutive win of the year Friday night but so did Brandon Wood and it turned into thriller. While Thomas has had the hot hand the last few weeks the competition has been working overtime to get a piece of the Moose. Several weeks ago Brandon Woods lost the handle on his machine and smacked the wall head on, wide open destroying a race car and beating up the driver. After a few weeks of recovery, a back up car and some heavy duty testing he's now back in the hunt to challenge the Moose. Brandon started the 20 lap feature with a great start and took the lead going into the first turn. Thomas was dead in his tire tracks searching for a path around. Lap after lap they ran nose to tail, every time the Moose would appear to get under him Brandon would slam the door close. As the laps ticked down the intensity picked up. After the half way sign the Moose was being pushed in the grass each time he tried to make a move, each time Brandon slammed the door and held the lead. The one to go flag was displayed and the Moose was on the loose, going into turn 1 he looked low and the door was closed, he carried the momentum off 2 and shot to the outside. Brandon tried the block, but it was too late, as they headed into 3. They came off of turn 4 side by side and the Moose was in full gallup. Brandon had the squeeze on, pushing the Moose to the wall. 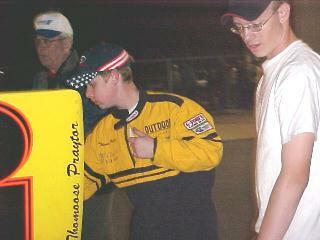 Dust and debris flew off the wall as the Moose held his line and he and Brandon were now rubbing to the checkered flag. This time the Moose was not to be denied as he took the win with less than an antler margin. 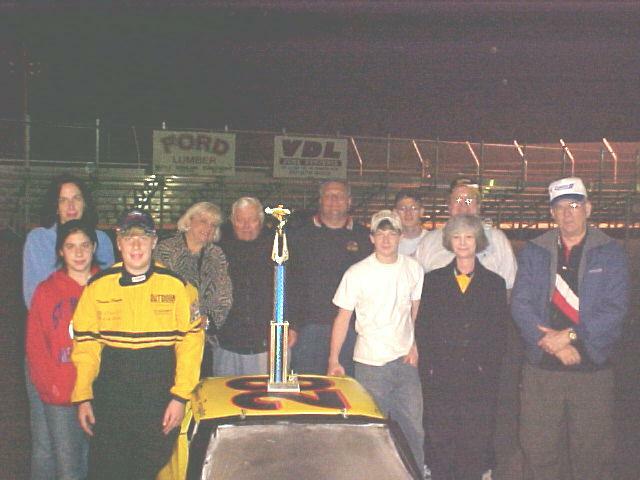 The win was Thomas's 3rd win in a row and his 6th feature win of the 2003 season. 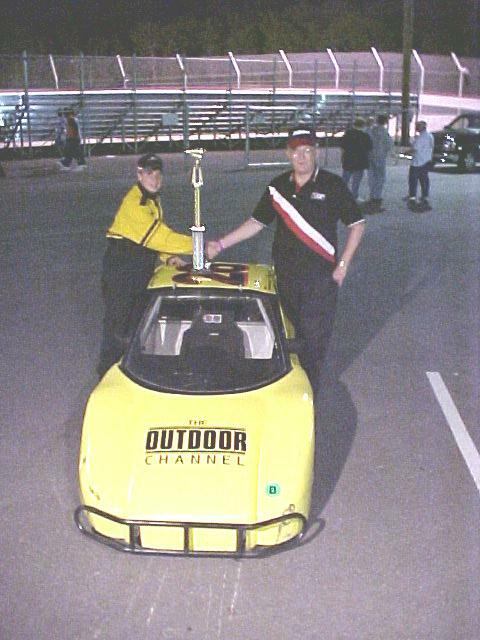 Mobile 5-2-03-Thomas had his buddy Adam Crawford back at the track this weekend and the pair teamed up for another big night for the Outdoor Channel Bandolero. Off the trailer Thomas was good and with Adams help got better. The duo won both heat races and the feature for the 5th feature win of the year! 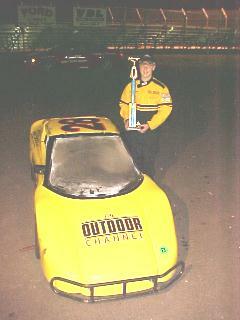 The Outdoor Channel Bandolero will be in action again this Friday night. Mobile-4-25-03 After the beating Thomoose took the previous week he was looking for a rebound and for a little extra luck he wore Rick Crawford's Truck Team hat from Daytona. 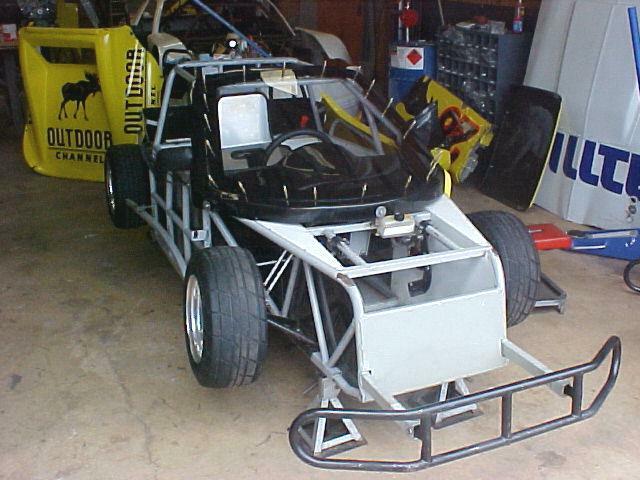 After having replaced most of the front suspension from the previous week there were a lot of questions as to how good the Outdoor Channel Bandolero would be. Within 5 laps off the trailer the Moose was turning lap times under the track record and he was headed for a good night. Thomas won the 2 heat races and carried the momentum over to the feature picking up his 4th feature win of the year and adding to his points lead. Sunny South Raceway 4-18-03-Thomoose was looking to continue his hot streak at Sunny South Raceway Friday night but it turned into a long night. Thomas went to the track fighting a stomach virus but was determined to add to his points lead. 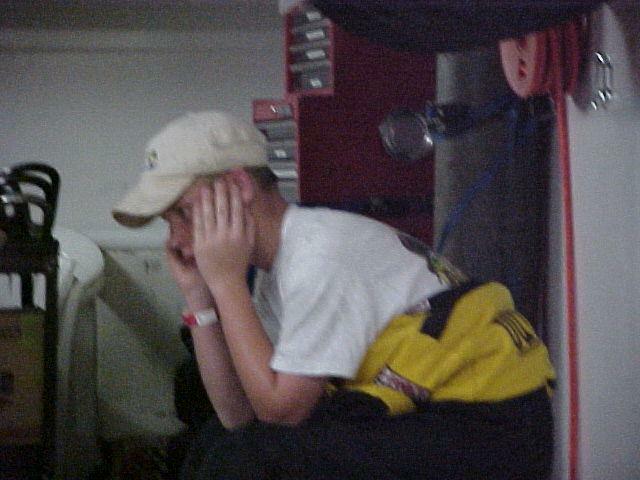 Even with his stomach churned up he turned in a solid practice dialing his car in to go racing. He picked up a heat race win and looked like he would have a strong performance in the feature. While leading the feature Thomas got tangled in a wreck that turned the Outdoor Channel Bandolero into a target with almost every car in the field getting a piece before it came to a stop. 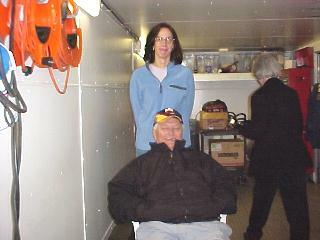 The first hit slammed Thomas's right knee into the dash of the car and the safety crew took him on his first race track ambulance ride back to the garage. After being checked out and iced up Thomas hobbled back to the hauler worried more about his car than his leg. 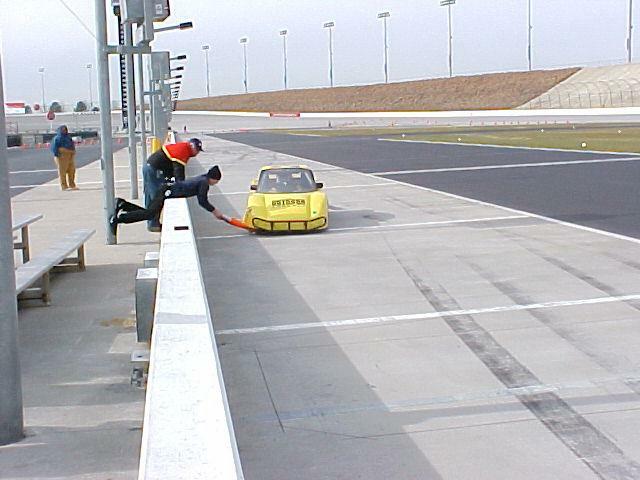 Sunny South Raceway 4-4-03-After loosing a photo finish the week before the Outdoor Channel Bandolero was looking for a rebound to victory lane. This time the Moose horned his way to the front on the start. Lap after lap Mike Ludlow was in the Mooses tire tracks waiting for a mistake. A slip off the 4th turn on the final lap allowed Ludlow to close the gap for another close finish with Thomas picking up his 3rd win of the year. 3rd Win of the year! 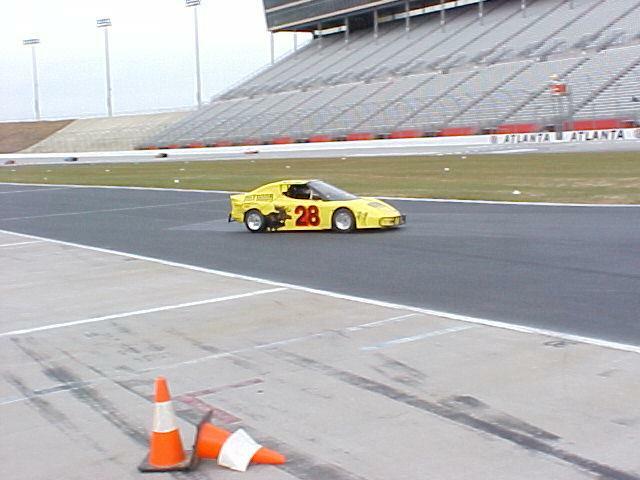 Sunny South Raceway 3-28-03-After starting the season with back to back wins, Thomoose was on a roll and looking for more last week. Last years track champion Bert Craig had other thoughts, starting the race with a big lead. 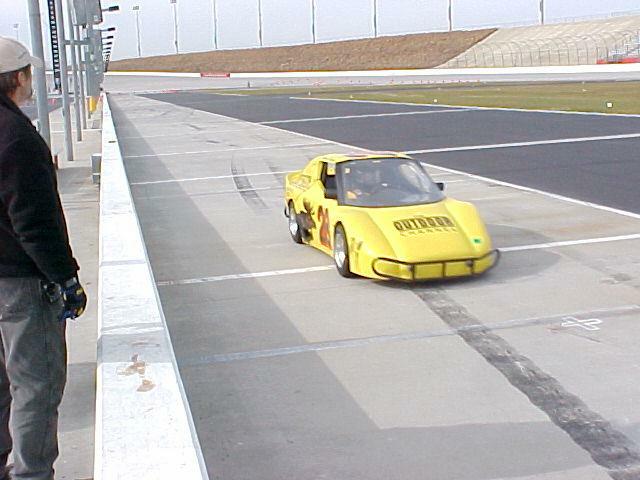 The Outdoor Channel Bandolero ran down the leader and on the last corner of the last lap got underneath him and they crossed the finish line side by side. In one of the best races of the year Thomas lost by an antler. Although, Thomas came home second anytime he can be that competitive with adults is a positive. This week finds the Moose on the hunt again looking to add to his points lead. 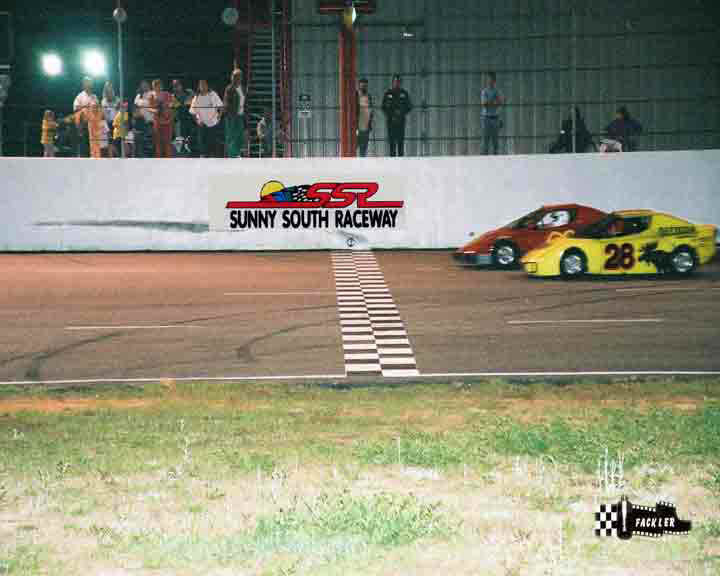 Sunny South Raceway 3-21-03-The Outdoor Channel Bandolero continued its winning ways with another win at Sunny south Raceway in Mobile. The first week had the Moose leading all but 1 lap, however, in week 2, Thomas had to work a little harder to pick up the win. Thomas and Adam post race with trophy. Dixie Clash Sunny South Raceway 3-15-03-The Outdoor Channel Bandolero team turned in a stellar performance Saturday night with a win at the 3rd Annual Dixie Clash. Over 200 laps of testing in the week leading up to the race paid big dividends as Thomas led all but 1 lap in picking up 3 wins and the Dixie Clash Title. While the car was good off the trailer, the crew, led by Adam Crawford kept making changes all night long to keep the Moose up front. So many changes in so little time had the crew working overtime, Anthony Claxton and Buddy Peoples helped make it happen. Adam Crawford put in a big performance working ont he car. Adam & Thomas talking set up. Jamie and Susan at the track. 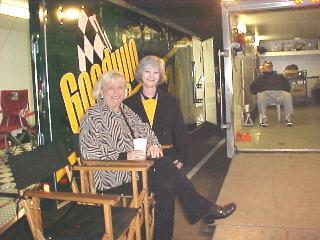 A little cool weather sent the cissies to the trailer for heat. 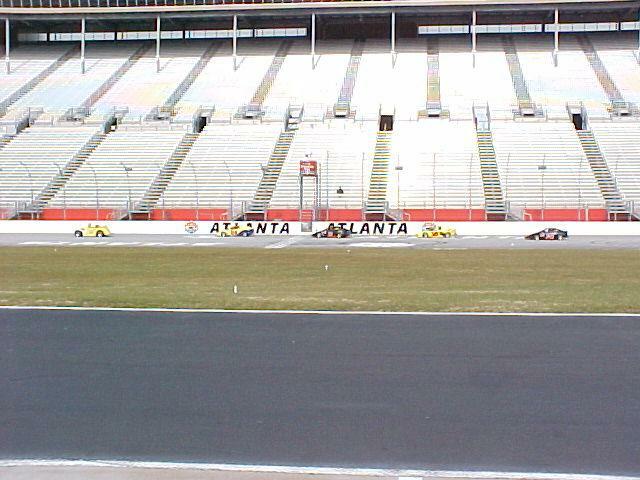 Atlanta Motor Speedway Road Course 1-12-03- After last years road course race experience Thomoose and the Outdoor Channel Bandolero team arrived in Atlanta with a lot of question marks. Both practice sessions ended up with the Moose coming back on the wrecker. The team battled mechanical problems during practice, replacing the parts and crossing their fingers for the race. Thomas started third with the front 3 breaking away from the rest of the field, the second place machine kept feeling the heat from the moose and on the last lap a right hander bit the second place car and Thomas rolled to a second place finish. By finishing second, Thomas transferred to race with the adults and had another good run finishing just outside the top 10 with a 12th place finish. Thomas set the table for the pit crew in the Atlanta Motor Speedway Competition but they didn't have a good day. Their claim to fame-"we weren't last!". Special thanks to Buddy and Susan Peoples for making the trip and taking these pictures. Racing down the front stretch. 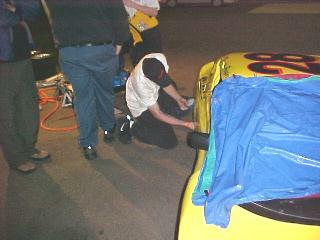 After finishing second Adam pulls a cone out from under the car to get ready to race again. The pit crew competition was different story. Adam Crawford, Bob Moore and Tommy Praytor were less than fast. OK they weren't last.